With less than a week before the launch of Windows 10, Microsoft wants all of its testers running the newest bits. In a message posted to the Insider Hub app, which comes pre-installed on versions of the upcoming operating system that the company released to public testers in the Windows Insider Program, Microsoft said that improvements to the Windows Store require users to be running build 10240 of Windows 10, which was released last week. 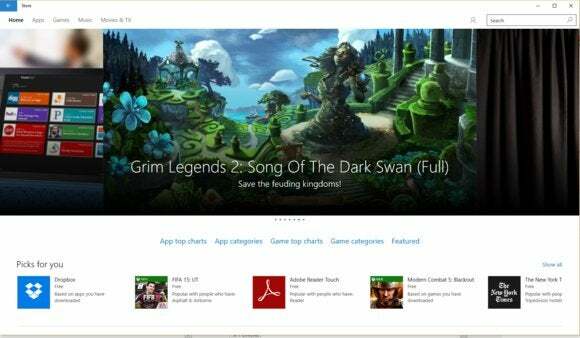 The Store plays an important role in Microsoft’s plans for the operating system, since it serves as a hub for people to purchase games, apps, music, movies and other content when using Windows 10. Under Windows 10, developers will be able to submit a broader range of apps for inclusion in the store compared to Windows 8, including web apps that are built to run on a user’s desktop and legacy Win32 apps in addition to “Modern” apps that feature a Windows 10-esque interface. The new operating system also includes support for what Microsoft is calling the Windows universal app platform, which lets developers build core application code that can then be run across devices from smartphones to the Xbox One. Users running build 10240 who want to make sure they have the latest version of the Store app can click on their profile picture next to the search bar, then click on “Settings” in the drop-down menu that shows up. The app’s version number should be equal to or greater than 2015.7.22.2. The store lockout will be another push to get testers onto the latest build of Windows 10 ahead of its launch on July 29. Windows Insider Program members will get first dibs on downloading the version of Windows 10 that rolls out to consumers on Wednesday. Microsoft has been rapidly pushing out updates to build 10240 that include bug fixes and other performance improvements over the course of the past week, and plans to continue doing so in the immediate run-up to Windows 10’s launch.